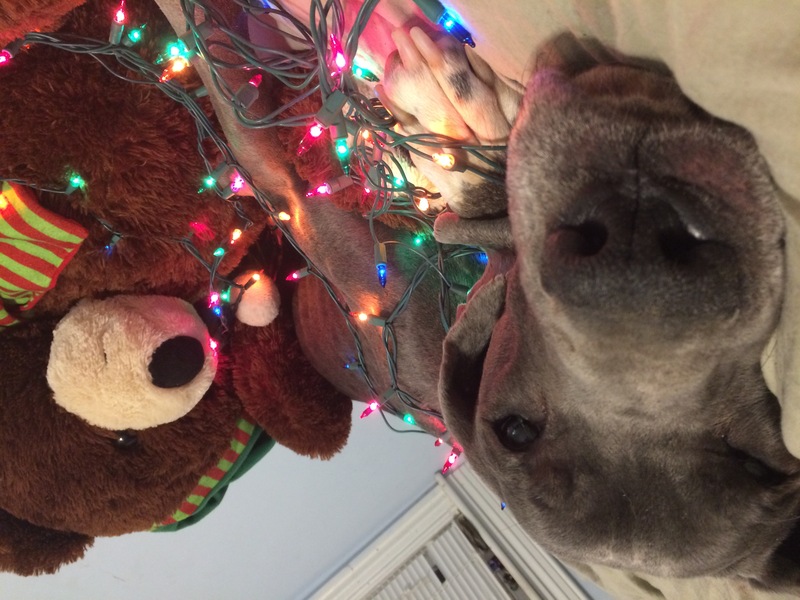 Christmas is right around the corner and who doesn’t love taking photos of their dogs with lights around them or by the tree or just holiday themed photos? Luckily, my boy Scorpius will do anything I ask, whether it’s stay in one spot with all kinds of crazy Christmas things on or around him or just staying focused. Does your dog not have patience like Scorpius? That’s okay. I have some tips for you to be able to catch that great Christmas photo. And the best part? You can use these tips ALL year round. ^Here he is, getting used to the lights, with two GLASS ornaments (I DON’T recommend this unless your dog has MASTERED the “stay” command, has a LOT of patience, and is GENUINELY calm), sunglasses, and two little plastic toys: Dalmatian dog and a minion. 2. Your pup should know the command “stay” long enough to stay for at least 2 minutes and you’re going to want a second person to help keep the dog’s attention. Favorite toys, treats, and things will be helpful. 3. Make sure you discuss with your second person who will be physically taking the photos and who will be decorating. For the sake of the article, person 1 is the photographer and person 2 is the decorator. 4. It’s always best to start in one position, take a break, then come back for the next. 1. Get them in whatever position you want for the photo and use your stay command. Lying down with the dog's head down will be the easiest one to get pictures that are great. You can then move on to laying down with head up, and finally sitting. You could even get creative and go with the different trick poses, like sit pretty. 2. Decorate. Decorate the dog, the floor, the walls—whatever it is your heart desires. Really, though, the only thing that should be needing decorations at this step should be your dog and spacing the other items closer if they’re too far away. 3. Person 2 will then grab favorite object and stand/kneel directly behind person 1. Person 2 will shake favorite object and may possibly need to make noises. Person 1, burst shots and multiple shots will be your friend. Start snapping photos as soon as person 2 is behind you. I would also like to apologize for such low quality photos of mine. They were taken by my backup cell phone which has a horrible camera and I'm still working on getting them switched over to a high resolution version. Married. Pet mama 🐾. Homemaker. Survivor. Can I Give My Dog Benadryl and How Much?